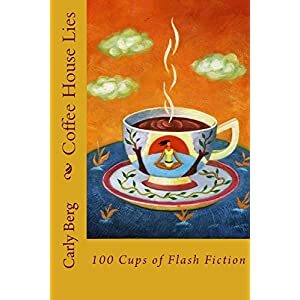 I learnt the art of writing flash fiction from Carly Berg through her book by the same name. And from this collection of hers, I have learnt the power that very short stories have. Coffee House Lies is a flash fiction collection of very short stories which can be read anywhere, any time. In fact, each story is refreshingly different, hence you feel like continuing; its like 'let me read one more!!'. Carly has ensured that each story is like a different cup of coffee, differing in taste, aroma and presentation. The stories range from being creamy and hot as a cappuccino, strong as an espresso, chocolatey as a mocha, icy cold as a frappe and at times both hot and cold like Viennese coffee. Well-written, these stories capture almost all variants of an imaginative mind. They also appeal to all possible emotions - joy, peace, sorrow, disgust, anger, courage, love, humour, astonishment, and the like. Left to myself, I could go on and on raving about these stories. To sum up, even if you dare me to pick my favourites, I can't, because each story has become a personal favourite of mine. And yes, this comes straight from the heart because, neither am I related to Carly nor do I know her personally. Its only her stories which are increasing my admiration for her. P.S- Carly you and your stories rock!! !